I feel like I haven't done a WIP Wednesday post for eons. I'll just check, hmmm I was right, 6th March was the last time I did a proper WIP post. To be honest, this isn't much of "proper" post. I haven't done much crafting over the last couple of weeks as I've been working on putting together the podcast. Now that the system is up and in place, all I will need to do is record the show and post it with show notes. I hope that means I will have enough time and strength to do some more blogging again. The main direction my crafting has taken, of late, is spinning. I have become seriously addicted. I finished the BFL I got from Picperfic. It's come out roughly a worsted weight or light aran. It's a 3-ply and I only have 81m. I think I will make them into mitts, so I can admire my own handiwork. Now I have this first usable skein, there is no stopping me. I bought two braids of fibre from The Yarn Yard. Each braid is 50g and prepared beautifully. The fibre is Superwash BFL and the colour is Beach. It is a lovely rich and deep colour and adore it. As soon as I had the Picperfic skein done, I was spinning the Beach. When I looked at the fibre I realised that the braid was made like a chain of crochet. Starting at one end the fibre is easy to pull out, leaving the rest of the fibre safely tucked in it's braid. 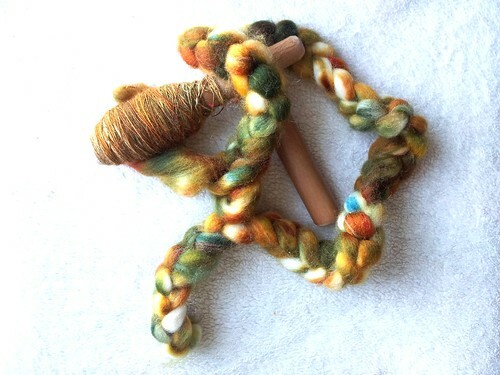 The fibre was so beautifully prepared that I simply started spinning from one end. I didn't need to split it. I seem to have got a very fine ply. I have about one eighth of this first braid left to spin. I will then spin the second braid and hopefully the resulting yarn will become a heavy laceweight. 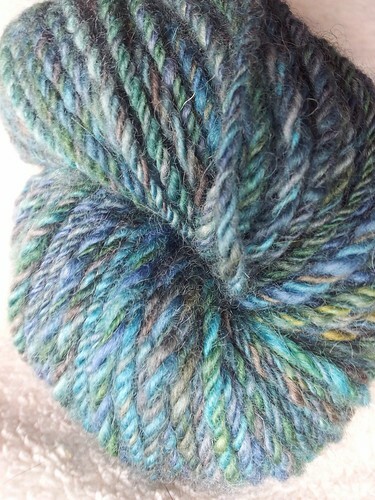 I'm really excited about that, because the yarn is such a rich colour that it would make a beautiful shawl. 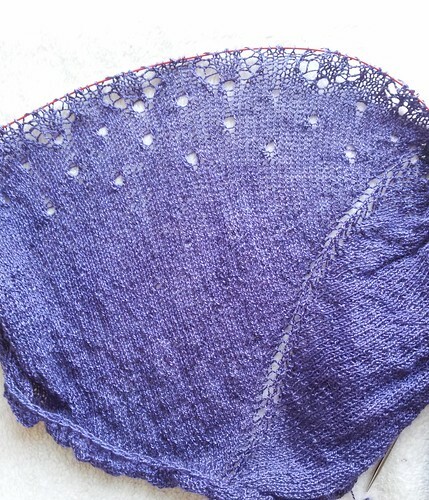 When I'm not spinning, I have been working on my most recent CTM project, the Dew Drops Shawl by Bex Hopkins. I increased the body of the stocking stitch section, of this pattern, as I have 800m of yarn, rather than the 600m the pattern suggests. I added two extra sections of 8 row repeats and I may add on another repeat of one of the lace charts, as the pattern gives instructions of which charts can be repeated to increase the size of the shawl. This is what I have so far. The yarn is really pretty and the charts are pretty straight forward. If I wasn't addicted to spinning, it would have been finished by now! I have also been playing with my birthday present, an iPad. One of the reasons I asked for this, instead of an android tablet, is that there are so many knitting apps that are not available on android. I have found Knit Companion which looks really good. JKnit also looks interesting, if slightly more complicated. Does anyone have any experience of either of these apps, and if so, what do you think? If you have any other suggestions for "must have" apps, knitting or otherwise, I'd love to hear from you. If I don't add anything other than the magazine reading apps, I'll be a happy woman, because reading a magazine on this thing is amazing. My partner (who bought it for me) keeps looking over at it and saying thing like "that screen is amazing" and "it looks like a glossy magazine". I think if he gets a bonus this year he may be buying one for himself. Either that, or he'll try pinching it from me! 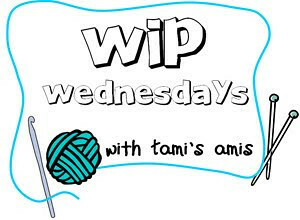 So with that skimpy WIP update, I shall leave you with the button to press that takes you to Tami's Amis so see other WIP posts that will probably have more lovely things to share with you. Oh, and don't forget to enter the Birthday Giveaway!